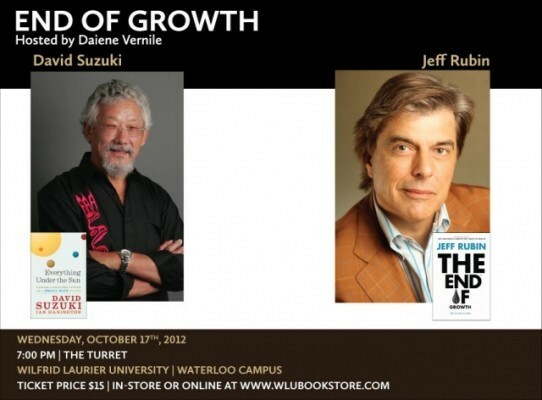 On Wednesday October 17, 2012, environmentalist Dr. David Suzuki and economist Jeff Rubin brought their eco tour to Wilfrid Laurier University in Waterloo. I had the pleasure of being among the hundreds who attended the evening, which was entitled “End of Growth: How to Achieve a Truly Sustainable Future”. The event was hosted was CTV Provincewide’s Daiene Vernile. Rubin is one of the first economists to accurately predict soaring oil prices back in 2000. He started by reflecting on the histories of previous world recessions post World War II and told the audience that all laws of economics point to the fact that when oil and coal prices reach 3 digits a barrel or a tonne, we’re basically feeling the contours of the growth limits of world economies. This translates to world economies slowing down not because the tap is closed on these natural resources, but because world economies can’t afford to continue to grow with prices in the three digits. This is good news for the environment, he said, because when world economies slow down, they combust less, and emissions go down. Rubin elaborates on his analysis in his latest book, The End of Growth. Following Robin, Dr. Suzuki spoke and expressed his excitement for sharing the stage with a “real economist”. As always in his unique and inspiring style, David reminded the audience that with the number of humans as a species, their over-consuming behavior, the nature of the global economy they invented, and the use of technology, humans on this planet have become a ‘force of nature’. He said that our priorities are screwed: instead of working to protect the very elements that make us alive (air, water, and soil), we use them as dumpsters for the toxins generated from our efforts to grow and protect the ‘economy’. 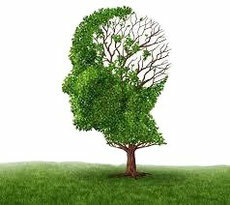 He stressed that a paradigm shift is needed where humans recognize that they are dependent on nature and can’t afford to think of themselves as superiors any more. He ended by saying, “Let’s put ‘Eco’ back into Economics”, and shared his observation that many young people are investing time and energy into urban farming and examining the sources of the food they eat. In his latest book, Everything Under the Sun: Toward a Brighter Future on a Small Blue Planet, David articulates his hopes for the future and offers solutions to environmental challenges. After addressing few questions from the attendees, Laurier’s president Max Blow reflected on what was said in the evening, and thanked the speakers for their thoughts and insights that align with Laurier’s vision to ‘inspire lives of leadership and purpose’. At the end of the event, Daiene Vernile told the audience that both gentlemen agreed to come for an interview at Province Wide on Sunday October 21, 2012.